Here's my low-end and no-name ("American Custom") set using minimal hardware. It's the standard 12", 13", and 16" toms and 22" bass drum (I replaced the awful-sounding steel snare with a wood Rogers snare). I've improved the sound of these black PVC-wrapped drums by using RIMS mounts on the 12" and 13" toms. I hung these toms from cymbal stands (and removed the bass drum mount) and this really made the bass drum much more lively. I disassembled all the black drums: removed the dampners and wrapped all the springs inside the lug casings with felt so they wouldn't rattle. The 12" wood timbale is home-made -- the body from an old bango I found in an antique store. I removed two-thirds of the lugs to make it easier to tune. 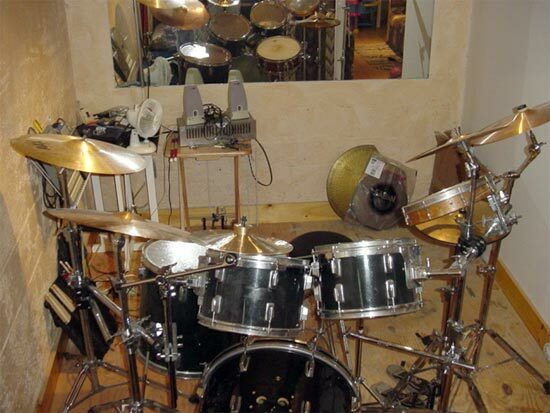 This drum sounds cool, the most distinctive of my kit. I also have two Latin Percussion cowbells (for when you need more). I've tried a variety of heads on this set and have settled on clear Remo Ambassadors for all (except the coated Ambassador on the snare). I have a hodge-podge of cymbals. My hi-hats are the best on this kit: 14" Sabian HH Fusion Hats. These have a bright "chick" and cut through the other sounds great. My main crash on my right is an 18" Sabian AAX. My 20" ride is the last remnant of my first cymbal pack: Zildjian Amir II. My second crash (on my left) is a 16" Sabian B8 Medium crash. I got this cheap on eBay and it sounds only slightly better than a trash can lid. Speaking of trash cans, I also have a 10" $9.99 Wuhan China. Finally, there's the 12" Sabian B8 Pro splash. 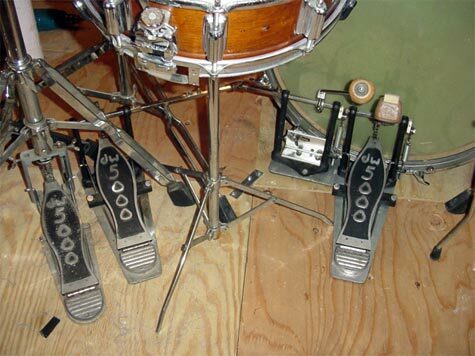 Though I don't use the left side much, my DW double bass drum pedal is shown below. Part of my Rogers snare (circa 1960s) can be seen in that photo too. After various experimenting with the bass drum, I've got the best sound out of it by putting a round piece of eggcrate foam directly against the head. On the inside there's another piece of foam around the bottom half of the shell and a pillow on top to hold the two pieces of foam in place (and there is no front head). Down below you can see my creative use of cymbal stands -- basically making a little rack. These two stands (one's a Rogers, the other unknown), the Collarlock and other clamps, and the cross bar hold a bunch of weight: my 13" tom, my ride cymbal, my 18" crash, my china, and my large cowbell. The crash and the ride are not on booms, I used those elsewhere. The other Rogers cymbal stand also holds a bunch: my 12" tom, 12" timbale, 12" splash, and my small cowbell (on a boom down low to place it to the right of my snare). 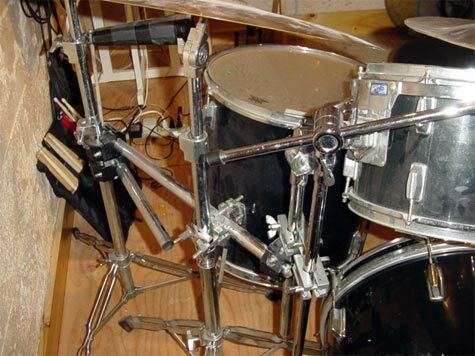 With the Collarlock clamp I was able to mount my tom arm horizontally so I could mount the timbale. At one point I had my 16" crash on this one stand too. It was a bit much, so when I was recently given a cheap cymbal stand I used that for the 16 alone. This kit is the result of years of piecing together various (mostly used) purchases. 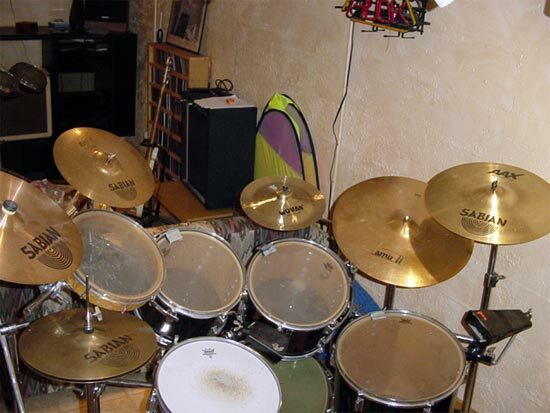 I started with the black set, an awful hi-hat stand and cymbals, and a 5 gallon bucket. 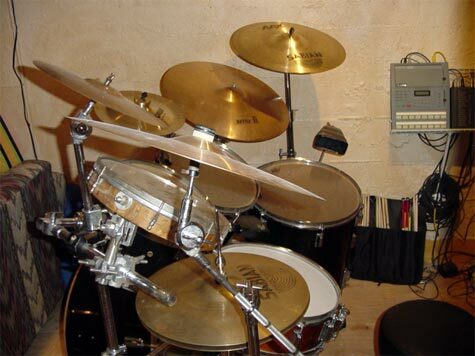 I soon made a throne out of a barstool and got a Zildjian Amir II cymbal pack from Guitar Center. Then I scored the timbale. 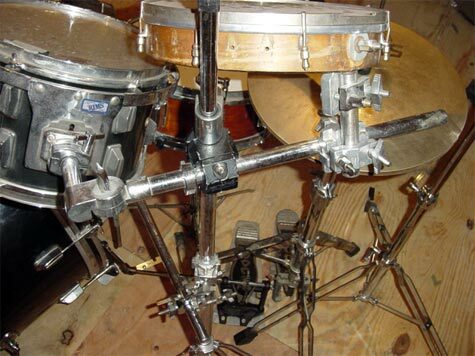 Later I acquired the RIMS tom holders, cymbal stands, Collarlock clamps, and the Rogers snare. The fusion hats are my latest (used) purchase.